With a new compound and structual make up the P Zero Direzionale F is able to maintain integrity even when pushed to the limits at high speed and in wet conditions. A reliable tyre that puts the fun back in to driving. 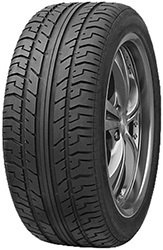 More even tread wear aims to make the tyres life span as long as possible, saving both you and the enviornment. This edition of the hugely successful and widely endorsed P Zero Direzionale F has been produced in association with Ferrari in order to ensure optimum perfomance from both vehicle and tyre when fitted to certain models in the Ferrari Range.